The Shaw Prize is an international award to honour individuals who are currently active in their respective fields and who have recently achieved distinguished and significant advances, who have made outstanding contributions in academic and scientific research or applications, or who in other domains have achieved excellence. The award is dedicated to furthering societal progress, enhancing quality of life, and enriching humanity's spiritual civilization. Preference is given to individuals whose significant work was recently achieved and who are currently active in their respective fields. The Shaw Prize consists of three annual awards: the Prize in Astronomy, the Prize in Life Science and Medicine, and the Prize in Mathematical Sciences. Each prize carries a monetary award of one million two hundred thousand US dollars. The nomination process begins in September, the winners to be announced in the summer and the prizes presented in autumn in the following year. 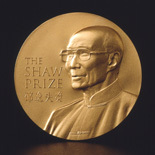 The Shaw Prize, established under the auspices of Mr Run Run Shaw in November 2002, is managed and administered by The Shaw Prize Foundation based in Hong Kong.